EOTTS-HyProCure® - Revolutionary and Evidence-based treatment for foot pain! E.O.T.T.S. stands for extra-osseous talotarsal stabilization. This is a minimally invasive procedure where an FDA cleared titanium stent is placed into a naturally occurring space in between the ankle and heel bones. This space, called the sinus tarsi, should always be open. There is no drilling or cutting with this procedure. The ankle bone is re-positioned on the heel bone which re-opens the space. The space is then sized to determine which size stent stabilizes the ankle bone while still allowing the normal amount of hindfoot motion. The stent is held in place by the bony chamber and the soft tissues found in this space. The EOTTS-HyProCure procedure is normally performed under a local anesthesia; some patients also prefer to have an IV sedation to completely relax them during this 20 minute procedure. One of the many advantages with this procedure is that it can be performed on both children and adults. Even when the HyProCure stent is placed into a child’s foot, it is unlikely that it will have to be replaced later in life. The good news is that the procedure is reversible if needed. EOTTS-HyProCure® is an evidence-based and minimally invasive procedure, which may help you stop suffering from pain and many side effects of misaligned feet such as knee pain, hip pain, and backpain. This revolutionary procedure has helped thousands of patient globally. Why Choose Dr. TJ Ahn for your treatment? Dr. TJ Ahn was recognized as the first HyProCure® Center of Excellence in Chicago area. The group is one of less than 20 nationwide to receive the designation from GraMedica, a global orthopedic medical device company headquartered in Macomb, Michigan. The Center of Excellence designation reflects superior quality of care, education and experience as related to the EOTTS-HyProCure® medical procedure. Dr. TJ Ahn is also certified by Atlas Foot Alignment Institute(FAI). Atlas FAI doctors focus exclusively on feet, and offer patients a world class level of expertise and care. The Atlas FAI treatment model revolves around the patient. With a highly trained team, precise imaging equipment, office-based surgical suite and helpful Treatment Coordinator—all together in the same center—we’re uniquely equipped to make treating foot concerns the best possible experience it can be for our patients. If you are a candidate for the EOTTS-HyProCure procedure, you’ll walk away from your consultation with a complete treatment plan. Do your research, talk it over with your loved ones and take time to decide if it’s the right choice for you. 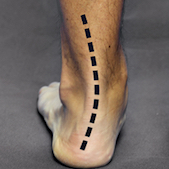 If you want to know more about Atlas Foot Alignment Institute, click here. Watch along as we see Sarah's HyProcure journey. See her thoughts, before and afters shots, recovery and more! Sarah explains how easy it was to have EOTTS-HyProCure ® Procedure in the office-based surgical suite with simple local anesthesia less than 20 minutes. Patient explains how EOTTS-HyProCure ® Procedure in the office-based surgical suite changed her life, from pain all over her body due to severe flatfeet to pain-free with beautiful natural arches. Patient shares his experience of EOTTS-HyProCure ® Procedure in the office-based surgical suite with simple local anesthesia within 20 minutes. Patient also explains his plantar fasciitis pain before the procedure and post-operative period. Patient realized that his TRUE cause of plantar fasciitis was coming from mis-aligned feet creating abnormal strain in his plantar fasciia. Patient explains how easy it was to have EOTTS-HyProCure ® Procedure in the office-based surgical suite with simple local anesthesia within 20 minutes. Patient also explains her pain before the procedure and post-operative period. Misaligned ankle bones are responsible for the majority of chronic problems to the foot and ankle. This rather common condition also leads to a chain reaction of destructive forces acting on the knees, hips, and back. This condition will not resolve on its own. Patients do not grow out of it and it cannot be properly treated with exercise or physical therapy. It is an anatomical, internal problem and only an internal solution can restore proper alignment. The secondary effects of misaligned feet include abnormal strain and pressure on joints, ligaments and bones throughout the body. EOTTS-HyProCure® procedure can decrease the strain to your feet, knees, hips and back. Furthermore, this life-changing procedure will help you in so many other ways. For instance, now that your feet are realigned you will be able to walk easier without the limiting pain. This means you will be able to increase your metabolism and with a good, healthy diet you should lose weight. This will reverse the ill-effects of many associated condition of weight-gain like obesity, diabetes, and high blood pressure. How does HyProCure® fix this underlying cause of pain? HyProCure® is a titanium stent that is placed, through a minimally invasive procedure, into a naturally occurring space between the ankle and heel bones. It instantly realigns and stabilizes the hindfoot while allowing normal joint range of motion. The overall balance and alignment of the foot/ankle will be improved and the arch of the foot may appear more normal. EOTTS-HyProCure® corrects this deformity at its root cause. It is an evidence-based procedure that has been performed on thousands of patients of all ages. When indicated, it is used by foot and ankle surgeons globally. Typically, most patients after the HyProCure® procedure are back to normal walking within a few weeks. The bones, tendons and ligaments throughout the foot and the rest of the body will adapt to the corrected position over the following several months. 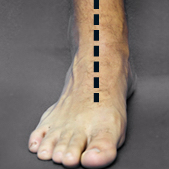 The photos below shows well-aligned foot after the HyProCure procedure. It stablizes and correct your internal misaligned joint, therefore fix the underlying cause. The HyProCure® stent is the leading device for EOTTS. It’s been FDA cleared since 2004 and is used by leading orthopedic and podiatric surgeons in 69 countries. In fact, tens of thousands of pediatric and adult patients have been helped with this innovative stent around the world. Finally, an internal solution that doesn’t involve complex joint limiting surgery, an extended recovery, or associated complications is now available. The research behind HyProCure® has proven this to be the best sinus tarsi stent. Are you ready to find if EOTTS-HyProCure® is the right treatment for you? Contact us today at United Foot & Ankle Surgeons for consultation.